For nearly three years, the U.S. District Court in Rhode Island has monitored the state’s progress in implementing a federal civil rights consent decree that seeks to integrate adults facing intellectual or developmental challenges with their communities, detailing the progress made and work yet to be done. With the 2014 consent decree nearing the middle of its 10-year run, and an earlier, more limited companion agreement designed to expire in July, 2020, Judge John J. McConnell, Jr. has asked participants to come to court next time with a different approach. In a hearing Oct.30, McConnell asked an independent court monitor, lawyers for the U.S. Department of Justice and state officials to come to court next time with a focus on the areas of greatest concern and to be prepared with recommendations for what the Court can do other than monitor developments. On Oct. 30, he boiled down the core issues into two parts. Each person protected by the consent decree should have a thoughtful long-range plan for a career that reflects his or her unique needs, preferences and goals. Actual services funded by the state should fit with the goals of the individualized career development plan. To be sure, McConnell praised the “tremendous progress” made by the state, including the closure earlier this year of the last sheltered workshop. He also heard about increases in supported employment, the growth of a quality improvement unit aimed at assuring all services meet high standards, and cooperation among state officials and private providers. Providers have said in recent months that their working relationship with state officials is better than it has been in many years. At the same time, problems persist in finding jobs for young adults and in providing high quality personalized support services for non-work activities that typically take up the majority of individuals’ time, according to the testimony McConnell heard. Continuing concerns about inadequate funding surfaced during the Oct. 30 hearing when the independent monitor, Charles Moseley, described a visit he and another consultant had with state officials and 16 providers in early August. In a report filed with the Court hours before the hearing, Moseley said “significant numbers” of the providers indicated that they continue to run deficits in key areas and that funding allocations for individual services are insufficient to cover the costs of the services that must be provided. Among major barriers to providing services, 94 percent cited transportation, 88 percent pointed to a lack of funding and complicated billing procedures for reimbursement, and 69 percent highlighted high staff turnover and poor job retention. All these factors become particularly problematic when the state and the federal government are asking providers to undertake more staff training to gain expertise in the principles and practice of individualization, to enroll more young adults as clients, and to provide individualized support in the community as each of their charges goes to different job sites and engages in non-work activities in various places. According to the consent decree, all young adults who left high school between 2013 and 2016 – those seeking adult services for the first time - were to be offered employment by July 1, 2016. But the state still hasn’t fulfilled that requirement, even after the deadline was extended to Sept. 30 of this year. Moseley reported that on Sept. 29, the state had achieved 77 percent of that goal, or 257 job placements out of an “employment census” of 334 young adults. Victoria Thomas, the DOJ lawyer, said she believes the state is using effective strategies to reach out to the remaining young adults and will monitor the situation. Students at the Birch Academy are protected by the predecessor to the 2014 statewide consent decree, called the Interim Settlement Agreement. The agreement, signed in 2013, was limited to addressing the use of the Birch high school program as a feeder to a now-defunct sheltered workshop in North Providence called Training Through Placement. Thomas said that, according to the Interim Settlement Agreement, students who turn 18 should have the support they need to make the transition to work or actually hold a job while they are still in school. Thomas said she wants to address the transition issue in the time remaining for the Interim Settlement Agreement, which is to end July 1, 2020. All parties to the settlement must be in “substantial compliance” with the Interim Settlement Agreement a year before it expires. What substantial compliance looks like might be different for the state than for the Providence School Department, said Thomas, telling the judge that the DOJ will prepare some recommendations on the matter. The city has met virtually every target set out by the Interim Settlement Agreement and earned McConnell’s praise. “Keep it up,” he said. The state is responsible to the court for the work done by the private service providers under the terms of both the Interim Settlement Agreement and the statewide consent decree. The providers’ performance got mixed reviews from Moseley and another consultant, William Ashe, who in early October analyzed a small random sample of plans, looking for the degree to which they were individualized and how they compared to the actual services provided. The consultants expected the providers to use a guide on “person-centered thinking” developed by the Sherlock Center on Disabilities at Rhode Island College to formulate plans that put a particular person’s needs, preferences, and goals at the center of the planning process. In 10 of the 17 plans, participants chose non-work activities from a menu of offerings that rotated on a weekly schedule, according to Ashe. But this kind of choice is not considered “person-centered” because the participants were not able to consider the the full range of opportunities available in the community. “It is fair to say that the implementation of person-centered planning remains a work in progress where there has been significant but uneven advances in the development of person-centered planning practices. There remains a significant amount of work yet to be done,” Ashe wrote. He found other instances in which plans indicated individuals had significant problems in communication. But neither the plans nor the actual services addressed ways in which communication could be improved. “Frequently, there were clear instances of personal preference identified in the planning process that did not appear to be reflected in the services that were actually happening, Ashe said. For example, one man indicated he wanted to learn to read and use a computer, but none of the goals written in his plan responded to that request. Some of the plans reviewed were for clients of Easter Seals Rhode Island, formerly Community Work Services, an agency that nearly lost its license to operate in 2017 but has made a dramatic turnaround during the last year. Ashe said “there are still very substantial steps that need to be taken in order to get this organization to an acceptable level of “person-centeredness” and to some extent, the same applies to other agencies. Agencies should “diversify” the way that integrated day services are provided, he said. From what Ashe observed, he said, it felt like community agencies like the YMCA and a bowling alley were becoming “a little bit like a day program” as staff and clients from one or more service providers gathered in the same place at the same time. At the bowling alley, staff from several agencies sat together with their clipboards and watched the bowlers, Ashe said. “A good person-centered plan by itself does not produce good person-centered outcomes. How to individualize and implement these plans needs to be a focus for training,” Ashe concluded. Read the full monitor’s report here. In the video, Kate Bowden, a staff attorney with the Rhode Island Disability Law Center and participants in Advocates in Action explain how to make a plan to vote. Here are some additional tips. an ID card issued by an educational institution in the U.S.
a Rhode Island voter ID card issued by the Secretary of State’s office. Time is running out, but if you know you won’t be able to get to the polls on Election Day and you haven’t applied for a regular mail ballot, you can still vote in-person before Election Day at your local Board of Canvassers at your city or town hall. You may also authorize another person to pick up your ballot for you. You must submit an original application for Emergency Mail Ballot no later than Nov. 5.
going online at this page on the Secretary of State’s website. contacting your local Board of Canvassers where you have registered to vote for further details. To be counted, all Mail Ballots must be in the hands of the Rhode Island Board of Elections by 8 p.m. Election Day. Watch the video demonstration to see how the AutoMark Voting System works. If you have questions about AutoMark, call the Rhode Island Disability Law Center at 401-831-5150. All polling places are required to provide accessible voting technology for voters with disabilities pursuant to the federal Help America Vote Act, Bowden says. Rhode Island uses the AutoMark Voting System. All voters are allowed to use the AutoMark equipment. Bowden says the machine reads the ballot to voters who are blind or have difficulty reading and marks the ballot for them. Bowden says the AutoMark equipment is positioned discretely so that passers-by can’t see how a voter votes. Bowden is pictured to the right helping Shauna Corriea practice how to cast her marked ballot during a recent conference of Advocates In Action. If you have disability-related questions about voting or your voting rights, you can call the Disability Law Center at 401-831-3150 (TTY 401-831-5335) anytime from 9 a.m. to 5 p.m. during the run-up to Election Day. If you’re having problems at the polls on Election Day, the hotline will be open during polling hours. Bowden said she has already voted so she can staff the hotline on Election Day. “If something comes up, we are in touch with the Board of Elections,” she said. For example, the polling place may appear to be inaccessible because the signage is not placed correctly. In that case, Bowden would call the Board of Elections and the Board would in turn direct poll workers to move the signage to the accessible door. Go to the Secretary of State’s Voter Information Center by clicking here. The Governor’s Commission on Disabilities would like you to bring to the polls with you the Commission’s 2018 Volunteer On-Site Polling Place Survey, which you can download and print by clicking here. Fill it out and email, fax, or mail it to the Governor’s Commission on Disabilities by the end of the Election Day week. (The address is at the bottom of the survey.) Ask your friends, co-workers, customers, and fellow members of your organizations to do the same. “Every citizen should be able to vote in the same location as their neighbors without help and without others seeing their ballot,” Bob Cooper, executive director of the Commission, said in a statement. Click here to download and print the survey. Anyone encountering problems or issues while conducting this survey or any barriers to voting may contact Cooper at Bob.Cooper@GCD.RI.Gov or call 401-462-0102. Registration information has been corrected. Tim Vogt, a nationally-recognized expert in building inclusive communities, will speak at a free seminar in Rhode Island November 3 that will be sponsored by several organizations that advocate for Rhode Islanders with intellectual and developmental disabilities and their families. Vogt is executive director of Starfire in Cincinnati, Ohio, where he has developed ways of making connections among individuals that rely on mutual interests and collective strengths while working around disabilities. The November 3 seminar will be at the Dean’s List Academy, 25 Esten Ave., Pawtucket. Check-in will begin at 9 a.m., with the presentation scheduled from 9:30 to 12:30. Anyone planning to attend is asked to register in advance at https://www.eventbrite.com/e/claiming-a-corner-of-community-tickets-51383200536 Additional sponsors are RI FORCE, the Rhode Island Developmental Disabilities Council and the John E. Fogarty Foundation. 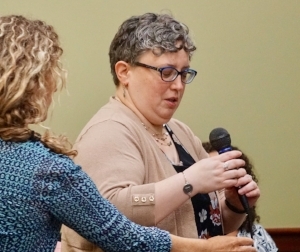 The Community Provider Network of Rhode Island, a trade association representing two dozen private organizations that serve adults with developmental disabilities, is a co-sponsor of Vogt’s visit to Rhode Island, Susa said. Advocates in Action RI will sponsor its 23rd annual statewide conference Oct. 25 for teenagers and adults with developmental disabilities who want to learn to speak up for themselves, with a day-long schedule of workshops geared to useful topics for more independent living. One presentation will feature a preview of what voters can expect when they arrive at the polls, with a lawyer from the Rhode Island Disability Law Center walking workshop participants through each step. Andrew Palumbo, a transgender man who received a leadership award from Advocates in Action in 2017, will be the keynote speaker. There is an additional charge for a Halloween-themed dinner-dance at the end of the day. To register for the day or evening events, click here. Project Sustainability, introduced in Rhode Island in 2011 as a method for enhancing individualized services for adults with developmental disabilities, instead has diminished the quality of their lives. That assessment set the stage Oct. 9 for deliberations of a Senate-sponsored commission charged with studying Rhode Island’s past and present system of developmental disability services, with the aim of designing a better future. At the same time, the chairman of the 19-member panel, Sen. Louis DiPalma, D-Middletown, emphasized that the purpose of the commission is not to assign blame but to learn from the past and present to figure out how to best move forward. The commission must report to the Senate by March 1. Project Sustainability was “a well-manicured statement to cover up” cuts in funding and services, said Tom Kane, CEO of AccessPoint RI, one of three dozen private agencies serving adults with developmental disabilities in Rhode Island. Project Sustainability had a “major impact on the quality of service we were able to deliver,” said Kim Einloth, a senior director at Perspectives Corporation, one of Rhode Island’s largest service providers. She said the community-based program of day services was forced to put people in large groups, lay off specialists like occupational and speech therapists and discontinue consulting services with physical therapists. Gloria Quinn, executive director of West Bay Residential Services, said she noticed immediately that the disabilities system was “demoralized, decreased and degraded” when she returned to Rhode Island after a nine-year absence in 2013. When Quinn moved out of state in 2004, she said, Rhode Island was one of the top-ranked states nationwide for its programs for adults with developmental disabilities. Quinn sits on the commission. In a meeting that lasted about 90 minutes, the commission covered a broad range of topics related to Project Sustainability and the controversies linked to it: inadequate overall funding, depressed worker wages, and an assessment used – or misused - to determine individual allocations for services. The planning and execution of Project Sustainability has been well documented, primarily by Burns & Associates, healthcare consultants hired by the Department of Behavioral Healthcare, Developmental Disabilities and Hospitals (BHDDH) in 2010. Rebecca Boss, the current director of BHDDH, reviewed the history of Project Sustainability, designed to bring uniformity to funding for specific services and enable families to make informed choices about services. Project Sustainability aimed to use data gathered through new funding methods to create incentives for services to be delivered in the most integrated setting possible, she said. “Change is hard, and even with perfect planning, it would not result in everyone’s needs being met,” Boss said. “I think everyone knows” that the current administration – including Governor Gina Raimondo, Kerri Zanchi, the Director of Developmental Disabilities, herself, “is committed to working with our stakeholders” to figure out “where do we go from here,” said Boss. “Many may have different views of history, as is often the case,” said Boss, a commission member. “Finally, under this administration, the regulations have been put forward that will put back the flexibility we need,” Kane said. The new regulations have passed a public comment period and are to be finalized by the end of the year. Funding, however, has a long way to go to support the kinds of changes providers, families, and consumers want, by all accounts. Commission member Andrew McQuaide zeroed in on historical funding of developmental disability services. McQuaide said that developmental disability spending had been on a downward trend in Rhode Island since 1993.That was the year before the last residents left the Ladd School, the state’s only institution for those with intellectual challenges. Between 1993 and 2008, Rhode Island’s expenditures for developmental disabilities decreased by 29.5 percent at the same time the national rate increased by 17.8 percent. Rhode Island is only one of 14 states to report a reduction between 2007 and 2009 in per-person expenditure, a decrease of 4 percent at the same time the national trend registered a 5.6 percent increase. McQuaide also said that anecdotal information indicates about half the state’s private providers were reporting operating deficits in 2009, ill-preparing them to absorb the additional funding cuts that came along with Project Sustainability. An overview prepared by the Senate Fiscal Office showed that actual spending on developmental disabilities, including both state and federal Medicaid funds, dropped $26.2 million in the fiscal year that began July 1, 2011 when compared to spending during the previous 12 months. The overview shows that, adjusted for inflation, the current budget still has not caught up to the spending reach of the developmental disability system in the year before Project Sustainability was enacted. Prior to Project Sustainability, private agencies negotiated an annual sum for each individual in their care. The new system generated standard reimbursement rates for each of 18 different services that agencies were authorized to provide. Kane noted that from the outset, the funding for Project Sustainability was not designed to cover all of the actual costs of private providers, almost all of whom had submitted extensive financial data to the state. A BHDDH memo for rate-setting that the department sent to the General Assembly noted that the reimbursement rates eventually adopted for Project Sustainability were 17 to 19 percent below “benchmark rates” which Burns & Associates calculated from the median wage for direct care jobs - $13.97 an hour. The state could not afford more, the memo said, citing the poor economy at the time. The memo said the lower reimbursement rates were calculated by reducing the allowances for fringe benefits for workers and in some cases, cutting transportation and program expenses. “I don’t understand why the expenditure of well over a million dollars on Burns & Associates wasn’t taken seriously enough” to put forward actual expenditures “and let the legislature decide whether it was appropriate,” Kane said. McQuaide said the experience of the last seven years has shown that it was a “fiction” to think the system of private providers would be forced to implement Project Sustainability without compromising services. The state has a separate system of group homes for adults with developmental disabilities which has not been subject to rules or the pay cuts that came with Project Sustainability. Instead, the workers are unionized state employees with full benefits. In the privately-run system, McQuaide said, the wages paid direct care workers still don’t reach the original $13.97 per hour “benchmark”, or median-pay rate, calculated by Burns & Associates. The most recent data available indicates that the average entry wage for direct care workers is $11.37 an hour. It comes from a survey of member agencies of the Community Provider Network of Rhode Island (CPNRI) conducted last February, according to Donna Martin, executive director of the trade association, which represents about two thirds of service providers in Rhode Island. Martin said she is in the process of updating the figure. Martin, a commission member, told the panel that CPNRI has met with the BHDDH leadership and representatives of Governor Raimondo’s office and the Office of Management and Budget to review current provider reimbursements in comparison to an extensive menu of rates envisioned by Burns & Associates in planning Project Sustainability. BHDDH, OMB, and the Governor have already planning a budget proposal for the next fiscal year. DiPalma said Burns & Associates originally wanted to advance a “competitive” average wage of $15.46 an hour. Addressing wage inequities will be a critical focus of the commission’s work, he said. Two years ago, DiPalma started a campaign to raise direct care wages to $15 an hour over five budget cycles. Massachusetts already pays its direct care workers a $15 hourly rate, and many Rhode Islanders find they don’t have to move to take advantage of these higher-paying positions at agencies that are an easy commute from their homes, DiPalma said. Another source of rancor over the last several years has been the assessment used to determine individual funding levels under the terms of Project Sustainability – the Supports Intensity Scale (SIS), which was updated in November, 2016. Even though the SIS has been revised, the state’s top academic researcher in developmental disabilities, A. Anthony Antosh, told the commission that using the SIS as a funding tool violates the original intent of the instrument as an aid for professionals designing individual programs of support for persons with disabilities. Antosh, a commission member, is the retiring Director of the Sherlock Center on Disabilities at Rhode Island College. His comments apparently prompted Kane to recall another moment in a Project Sustainability planning meeting in which Burns & Associates’ human services partner praised the multi-faceted assessment providers were using at the time to figure out how much funding a particular person needed. In each case, the assessment took into account intellectual capacity, responses in various situations and potential risks. Policy makers should also take into account the goals of the programs, such as increasing community integration or increasing employment, before determining the array of services and rate schedules, HSRI said. A call for higher pay for direct service workers who assist persons with developmental disabilities ran like a thread through a General Assembly candidates’ forum in Newport Oct. 3, with several speakers saying better wages will help stabilize the system and improve quality. Legislators urged an audience of about 25 to make their names and faces known at the State House to press this and other concerns when the General Assembly convenes again in January. State Sen. Louis DiPalma, D-Newport, Middletown, Little Compton and Tiverton, said that Rhode Island cannot transform services for adults with developmental disabilities on a budget that has the same buying power as it did in 2011. 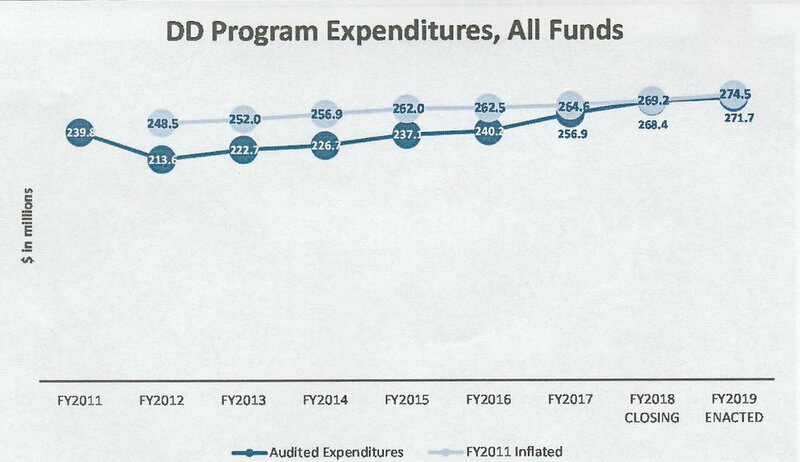 In Fiscal Year 2011, Rhode Island spent about $242 million on developmental disabilities, DiPalma said. Adjusted for inflation, using the consumer price index, that’s equivalent to the $272 million currently budgeted for the state Division of Developmental Disabilities. DiPalma offered a glimpse of the work ahead for a Senate-sponsored commission that will convene Tuesday, Oct. 9 to begin discussing the current fee-for-service reimbursement system for private providers of supports to adults facing intellectual and developmental challenges. The reimbursement system, called “Project Sustainability,” was inaugurated in Fiscal Year 2012, along with cuts that slashed spending on developmental disabilities from $242.6 million to $216.5 million, according to state figures. Since 2014, the state has been under pressure from the U.S. Department of Justice to end an overreliance on sheltered workshops and other segregated care for adults with developmental disabilities, and instead emphasize competitive employment and integrated non-work activities to comply with the Americans With Disabilities Act. At the Oct. 3 forum, DiPalma said the current practice of awarding individual funding authorizations according to the “level” of a person’s lack of independence is “just wrong” when successful appeals of individual awards have resulted in supplemental expenditures of up to $25 million a year for legitimate additional services on a case-by-case basis. DiPalma, the chairman of the commission, said the panel will review every aspect of “Project Sustainability - what it is, how did we get there, and where do we want to go? What are the gaps?” The commission will meet at 3:30 p.m. Oct. 9 in Room 313 of the State House. Rep. Deborah Ruggiero, D-Jamestown and Middletown, who has six years’ experience on the House Finance Committee, said people with disabilities want the exact same thing that people without disabilities seek – meaningful lives. “It’s not right that people can make more money at McDonald’s than they can supervising people with intellectual and developmental disabilities, “ Ruggiero said. One consequence of “Project Sustainability” has been double-digit cuts in wages, which also have derailed benefits such as health insurance, and opportunities for career advancement offered workers by private service-provider agencies. The wage cuts destabilized an entire workforce, which now averages a turnover rate of at least 33 percent a year. 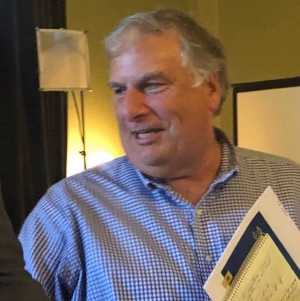 Rep. Dennis Canario, D-Portsmouth, Tiverton and Little Compton, himself the father of someone with developmental disabilities, said that people generally “don’t understand the detrimental effect” of staff turnover on the individuals they assist. Workers must have “expertise” to keep their clients on an even keel, particularly in some cases where clients are “very involved,” He said that It takes “expertise to turn situations around” or to keep individuals focused on the job at hand. Connecticut and Massachusetts “are way ahead of us,” he said. DiPalma noted that Massachusetts has already negotiated a minimum $15 hourly wage for direct care workers who are members of the Service Employees International Union. Many of the workers in nearby Massachusetts towns have trained in Rhode Island and still live in Rhode Island, he said. DiPalma has sponsored a campaign to get a $15 hourly wage in five years, but it stalled in the last session of the General Assembly, when the developmental disability system was threatened with an $18 million cut in services. In the end, the legislature restored the status quo, but no gains were made. Nevertheless, advocates deserve a “great round of applause for restoring that funding,” said Sen. Dawn Euer, D-Jamestown and Newport. She and others, including Rep. Kenneth Mendonca, R-Portsmouth and Middletown, urged them to keep it up. Sen. James Seveney, D-Portsmouth, Bristol and Tiverton, signaled that he and his colleagues will again be pushing for a wage increase for direct care workers in the 2019 General Assembly session. With the 2014 federal consent decree driving more integrated employment and community –based activities, the state must invest in additional transportation to make those opportunities a reality, said Euer. Others echoed her concern about transportation. Terri Cortvriend, the Democratic candidate for Mendonca’s seat in the House, said she wanted to learn more about developmental disability services, particularly whether individuals and families are satisfied with the greater emphasis on competitive employment. Cortvriend currently chairs the Portsmouth School Committee. Susan Vandal, a member of the audience, said families who have a child with a developmental disability want a system that allows them a “single point of entry” that begins early intervention for infants and toddlers and takes them seamlessly through the school years into adult services. Parents must now jump through too many hoops, particularly in the transition from school to adult services, she said. Transition from high school to the adult system is also one of the prime concerns of an independent court monitor overseeing implementation of the consent decree. The forum held at the Newport campus of the Community College of Rhode Island, was sponsored by the Newport County Parents Advocacy Group and Rhode Island FORCE (Families Organized for Reform, Change, and Empowerment.) RI FORCE streamed the event live and has posted the recording on its Facebook page, here. A special Commission of the Rhode Island Senate will hold its first meeting Tuesday, Oct. 9 to begin studying the impact of “Project Sustainability” on services for adults with developmental disabilities, its chairman, Sen. Louis DiPalma, D-Middletown, has announced. The meeting is open to the public. Project Sustainability is the name of the fee-for-service reimbursement system for Medicaid-funded supports for adults with intellectual challenges that was enacted by the General Assembly in 2011. The system features a standardized assessment of each client’s needs which is then translated by an algorithm into one of five levels of individual funding. It was introduced as a more equitable way of allocating funds than the previous method, in which providers negotiated flat rates for each client in their care. But Project Sustainability, which was accompanied by significant budget cuts, has been controversial from the start. The state first calculated a myriad of distinct reimbursement rates based on existing median wages for direct care workers. From there it slashed the rates an average of 17 percent in the budget for the 2011-2012 fiscal year, citing a poor economy. Providers were forced to cut wages drastically, leading to an instability in the workforce that persists today. Advocates say the high turnover prevents the state from achieving the goals of a 2014 federal civil rights decree that followed in the wake of Project Sustainability. The U.S. Department of Justice criticized the state for incentivizing segregated care in day centers or sheltered workshops that can be managed with a minimum of staff. An over-reliance on this type of care violates the integration mandate of the Americans With Disabilities Act, the DOJ found. DiPalma, the commission chairman, said the 19-member commission includes two consumers, other advocates, providers and representatives of the executive branch of state government. The commission will accept public comment at every meeting, he said. The first meeting will cover the history of Project Sustainability and spell out the goals of the commission, according to a statement issued in DiPalma’s behalf. The meeting will begin at 3:30 p.m. Oct. 9 at the State House, but the room has not yet been selected, DiPalma said. A public hearing Sept. 17 on proposed regulations for developmental disability services in Rhode Island lasted less than 15 minutes – a brevity which seemed to reflect well on the state’s rule makers and the committees that helped streamline hundreds of pages of material, some of which dated back more than a decade. Donna Martin, executive director of the Community Provider Network of Rhode Island (CPNRI), said as much. She commended all state officials involved in drafting the proposed regulations, particularly those in the Office of Facilities and Program Standards and Licensure, “for their fidelity to an open stakeholder engagement process as these regulations were reviewed and updated.” The office is part of the state Department of Behavioral Healthcare, Developmental Disabilities and Hospitals. Representatives of service providers, families, advocacy organizations, and adult consumers of services all participated in a review process launched a year ago. The term is so offensive to those with intellectual or developmental disabilities and their supporters that there is a national campaign to eradicate it. It’s called “Spread The Word To End The Word”. In 2010, Congress passed Rosa’s Law to replace the term “mental retardation” with the words “intellectual disability” in relevant federal statutes. Most states have followed the federal government’s lead, according to the Institute on Disability at the University of New Hampshire. The lone instance Martin spotted in the overall proposal was not in developmental disability regulations themselves, but in a department-wide rule regarding the duty of certain officials to report suspected neglect or abuse of vulnerable individuals. having to pay for background checks for potential employees. “This is a costly, unfunded mandate, and we urge the state to enact a policy that aligns with state statute ensuring that the state pays for or reimburses” developmental disability and behavioral healthcare providers for these costs, she said. keeping health care records for 10 years instead of the current 7 years. In another comment, Martin said that the definition of the “staff” of developmental disability service organizations licensed by the state should not include interns or volunteers, who are not employed by these providers. The public comment period ends Oct. 6. Comments may be addressed to Gail Theriault, Esq., Department of Behavioral Healthcare, Developmental Disabilities and Hospitals, Office of Legal Counsel, Hazard Building, 41 West Rd.,Room 241, Cranston, RI 02920. Long-awaited revisions to regulations governing Rhode Island’s services for adults with developmental disabilities, as well as other functions of the Rhode Island Department of Behavioral Healthcare, Developmental Disabilities and Hospitals (BHDDH), are to be discussed in public hearings Tuesday, September 18, at the Arnold Conference Center in Cranston. In the Division of Developmental Disabilities (DDD), the changes are intended to give providers the flexibility to better tailor services around the unique needs and preferences of each individual, according to Kevin Savage, the Director of Licensing at BHDDH. On Aug. 21, before the proposed regulations were made public, Savage agreed to describe the purpose of the changes in general terms. He said he would be was prohibited from making any remarks once the public comment period opened. That happened Sept. 6, when the proposed regulations were posted on the Secretary of State’s website. Written comments will be accepted until Oct. 6. The regulations are part of a broader context that includes standards of quality which developmental disability service organizations must meet to obtain and keep an operating license. Until now, the standards of quality have been part of the regulations, which carry the force of law. But Savage, the BHDDH licensing director, has said that arrangement stifles the flexibility of providers to tailor services to the needs of individuals. Providers have also complained of lack of flexibility, particularly in light of demands of the 2014 consent decree which mandates integrated day services. In the proposal, the standards of quality, or “certification standards” would no longer be part of the regulations, but instead serve as guidance about what organizations must do to become licensed or have their licenses renewed. Here are links to the quality, or “certification” standards. Until now, the standards of quality have been part of the regulations, which carry the force of law. But Savage, the BHDDH licensing director, has said that arrangement stifles the flexibility of providers to tailor services to the needs of individuals. xxxxxxThe regulations are part of a broader context that includes standards of quality which developmental disability service organizations must meet to obtain and keep an operating license. Long-awaited revisions to regulations governing Rhode Island’s services for adults with developmental disabilities, as well as those for behavioral healthcare, substance abuse prevention and treatment and state hospitals, have been posted by the Secretary of State’s office and are to be discussed in public hearings Tuesday, September 18, at the Arnold Conference Center in Cranston. A link to new and old regulations is in the “What’s New” section of the website of the state Department of Behavioral Healthcare, Developmental Disabilities and Hospitals. The first hearing, on rules and regulations for developmental disability service providers, is scheduled at 11 a.m. At 1 p.m., the discussion will shift to the licensing of all service providers and facilities that are funded by BHDDH. And at 3 p.m., there will be a hearing for rules and regulations governing behavioral healthcare organizations. Written public comment will be accepted until Oct. 6. Kiernan O’Donnell, foreground, addresses DDD public forum in East Providence, RI, while Charles Moseley, independent federal court monitor in Rhode Island’s Olmstead consent decree case, participates via video link. All photos by Anne Peters. It’s no secret that Rhode Island’s Olmstead consent decree has put the focus on employment opportunities – and challenges –in the system of state-funded services for adults with developmental disabilities. Four and a half years after the consent decree took effect, the state Division of Developmental Disabilities (DDD) still finds it necessary to punch holes in the myths about what the state’s Employment First policy means and doesn’t mean. Employment First was created to respond to the consent decree’s push toward integration of those isolated in sheltered workshops and day programs, as required by the Olmstead decision of the U.S. Supreme Court, which reaffirmed a key part of the Americans With Disabilities Act. “We’ve had a lot of people worry that if they don’t work, they won’t get benefits,” said Anne LeClerc, Associate Director of Program Performance. That’s simply not true, LeClerc told about 80 people crammed into a room at the East Providence Senior Center and an unknown number of others who watched the presentation live on Facebook from the comfort of their homes. LeClerc said there’s there’s no requirement that adults with developmental disabilities who receive state-funded services must work, but if they want to be employed, the state will provide job-related supports. “Not everyone has to work, or is ready for work now,” she said. Individuals may have health or family issues that prevent them from working. It may take “a long time” for people to prepare for work in various ways, LeClerc said. The consent decree requires those who choose not to work to make an “informed choice,” he said. What makes a decision an informed choice are trial work experiences, with the appropriate supports, and a vocational assessment, Moseley said. And back in East Providence, Kiernan O’Donnell added a third element of informed choice: individualized benefits counseling from a specially-trained expert in how a paycheck might affect Social Security or other financial support received by a person with disabilities. He said Social Security benefits are so complicated that only specially trained counselors are qualified to recommend work options to individuals receiving public assistance. (The Paul Sherlock Center on Disabilities at Rhode Island College offers free Work Incentives Public Information Sessions. For more information, click here. LeClerc, meanwhile, said individuals 62 years old and older who don’t want to work may simply choose to retire. People younger than 62 who opt out of the job market must submit a variance to the state’s Employment First policy, LeClerc explained, “A variance is just documentation of a decision not to work,” she said. The variance form asks why “work is not right for you,” LeClerc said. Someone prevented from working by poor health need simply note that as a reason, but no medical documentation is necessary, she said. “The variance itself is a one-time thing,” LeClerc replied. During individual service plan meetings held annually, those individuals who have previously chosen variances will simply be asked whether they’re still happy with their decisions not to work. If not, they may reconsider. One member of the audience told LeClerc about the experiences of individuals over retirement age whose individual service plans were rejected because they didn’t have a career development component. Individual service plans are important documents used by DDD to document the services that Medicaid will pay for. “We’ll work on making that clearer,” she said. If the problem occurs again, LeClerc told the woman, consumers and their advocates should get in touch with her. ( LeClerc can be reached at 401-462-0192 or Anne.LeClerc@bhddh.ri.gov. O’Donnell’s general advice: get the information in writing. APSE, the national organization of supported employment advocates and professionals, offers its own fact sheet busting the “Top Ten Myths” of Social Security Benefits. “Let’s not get hung up on barriers when we are able to combat them with knowledge,” he said. Mary Beth Cournoyer, who serves on a community advisory committee, the Employment First Task Force, said that many people looking for jobs need “customized employment” – self-employment or work individually designed to match the skills of a particular employee with the needs of an employer. For example, someone with a disability can be trained for a part-time job running the paper shredder at a large law firm, freeing support staff for other duties. The idea of customized employment is “new to families,” said Cournoyer, who has a son with a developmental disability. Parents feel that they may need 30 hours of job coaching, but only have enough funding for 10 hours, she said. “I don’t want to see jobs and capacity missed because we don’t have enough money for a coach,” she said. Moseley said Cournoyer’s concerns about funding for services “is a great question for Kerri” – a reference to Kerri Zanchi, Director of Developmental Disabilities. Funding “is a challenge. It might change,” he said. Moseley segued to initiatives that might improve the outlook for adults with developmental disabilities and their families, including a commission, chaired by State Rep. Louis DiPalma, D-Middletown, to study the effectiveness of the current funding system. The commission is expected to convene in October. In August, Moseley said, he talked to private service providers about changes they are making. “There are a lot of exciting things moving forward, but also barriers,” he said. Zanchi, meanwhile, ticked off initiatives of DDD, including the preparation of an application to the Centers for Medicare and Medicaid Services for approval of a pilot Alternative Payment Model that would give providers a flat rate for a defined bundle of services rather than the current fee-for-service reimbursements that providers say restrict their flexibility to meet clients’ needs. Zanchi and LeClerc both emphasized improvements in data collection that will help them better identify and respond to the needs of those served by the developmental disability service system. One mother, Lenore Costa, said her son, who has Fragile X syndrome, has not been able to get any developmental disability services in the year the family has lived in Rhode Island. Costa said she moved from Massachusetts, where her son received day, evening and weekend services, to take advantage of a professional opportunity as a nursing executive. It’s a big job, she said, but her son’s needs are also a full-time job. Zanchi connected Costa with a DDD social work supervisor, who sat down with her after the meeting. Masland works at the Rhode Island Parent Information Network with families facing special health care needs and has a 19- year-old daughter, Olivia, who has loved her 12 years of schooling and is now in her first transition year. Olivia has a work trial in food prep at a Chili’s restaurant 45 minutes a week, and while she’s excited about her t-shirt, her hat, and her special work shoes, her mother said she’s not sure that the experience is preparing her for a job. Anne Peters said her 27-year-old daughter has been looking for a job for three years, and any work she finds will be part time. With that in mind, she asked whether the emphasis on jobs is jeopardizing the quality of non-work day services. Heather Mincey, the assistant director of developmental disability services, said that was a hard question to answer on an individual basis. Job-related supports cost more than non-work services, but they both come out of a fixed funding authorization for a particular individual. Mincey suggested that over time, the funding for work and non-work activities will even out if job supports eventually can be faded away. With the closing of some day programs, Peters said, there are a “lot of movies and malls” for “non-work services,” suggesting that more purposeful activities would better meet quality standards. Mincey acknowledged that it is difficult for providers to shift from center-based care to integrated services. She noted that DDD recently hired two quality assurance officials to work with LeClerc for a year on program improvements. Peters added that addressing high turnover and low wages among support staff is a critical part of any solution to the problems the system faces. Christopher Semonelli, vice-president of RI FORCE (Families Organized For Reform Change and Empowerment) said members of the General Assembly need to hear the breadth and depth of concerns expressed at quarterly public forums. He said RI FORCE will sponsor a candidates’ forum Oct. 3 from 4 to 7 p.m. at the Newport campus of the Community College of Rhode Island. The family advocacy group RI FORCE plans to use its Facebook page to live stream the Sept. 11 public forum sponsored by the Rhode Island Division of Developmental Disabilities, according to the organization’s chief spokesman, Christopher Semonelli. Once the meeting concludes, the video will remain available on Facebook, Semonelli said in an email. The public forum, focusing on employment, will feature a question-and-answer session by the independent federal court monitor overseeing the implementation of inclusive policies and practices as part of the state’s compliance with a 2014 civil rights decree. RI FORCE stands for Rhode Island Families Organized For Reform Change and Empowerment, and a link to the group’s Facebook page is here. The independent federal court monitor overseeing Rhode Island’s compliance with the integration mandate of the Americans With Disabilities Act is scheduled to make a rare public appearance outside the courtroom – by video conference – Sept. 11 at a quarterly community forum in East Providence sponsored by the state Division of Developmental Disabilities (DDD). According to a DDD announcement, the monitor, Charles Moseley (pictured at left). The forum will focus on employment–related issues, including what it means to make an “informed choice” about work, and how someone who chooses not to work can apply for a variance to the employment first policy. The Sept. 11 meeting will be at the East Providence Senior Center, 610 Waterman Ave., from 4:30 to 6 p.m. The 2014 agreement with the U.S. Department of Justice requires the state to de-segregate daytime work and non-work services for adults with developmental disabilities over a 10 year period to comply with the integration mandate embodied in Title II of the ADA. The integration mandate was re-affirmed by the Olmstead decision of the U.S. Supreme Court in 1999, which involved two plaintiffs with developmental disabilities who had been held in a Georgia mental hospital for years after their treatment concluded because of a dearth of housing in the community. Rhode Island’s was the first Olmstead consent decree in the nation – but not the last - that addressed the integration of daytime activities for adults with developmental disabilities. Earlier agreements which drew their authority from the same `High Court decision focused on segregated housing. The state of Rhode Island has already met or surpassed the 2018 supported employment goals for adults with developmental disabilities who were in sheltered workshops or segregated day programs when a federal civil rights consent decree was signed more than four years ago. But it appears the state will not meet a looming Sept. 30 employment deadline for young people seeking adult services for the first time; specifically, 426 individuals who left high school special education programs between 2013 and 2016. The prospect of the missed deadline – itself a two-year extension of the original - suggests a lack of underlying funding, if not for specific employment–related services, then for the entire package of supports that newcomers usually seek when they look for an adult service provider. For years, representatives of the three dozen private agencies reimbursed by the state Division of Developmental Disabilities (DDD) have told legislators that the amounts they are paid do not cover the actual costs of providing services. Taking on new clients often means taking on additional debt, they have testified. To be sure, DDD has pressed forward with reforms on a number of fronts, most prominently a program of enhanced reimbursement rates to private providers for supported employment services and performance payments for job placement and retention. The program was launched in January, 2017. One agency that extended itself to embrace the new program, because officials believed it was the right thing to do, nevertheless ended the year with debt in that account in the high five figures, according to several sources. In January of this year, the rules were relaxed to allow agencies to spend from the supported employment program to look for jobs for clients already on their caseload, providers have said. In 2018, young adult participation in the performance-based employment program “has not significantly increased despite the increase in available funds for this population,” according to a second quarter report from the state to an independent court monitor in the consent decree case. The report has been obtained by Developmental Disability News. The General Assembly initially allocated a total of $6.8 million in federal-state Medicaid funding that financed the supported employment program from January, 2017 through June, 2018, but more than half the money was not spent. At the end of June, BHDDH was scheduled to return to the state about $4.1 million, according to a House fiscal report. State revenue accounts for about $2 million of the total. As of June 30, a total of 231 young adults were employed, a figure that slightly exceeds the requirement that 50 percent of “youth exit” members have part-time jobs by that date. But it has taken the state four years to reach the half-way mark as it works toward the consent decree goal of full employment for young adults, leaving only three months to find jobs for the remaining half of the “youth exit” population – nearly 200 individuals. Among all those who got jobs through the supported employment program, 81 percent have remained employed for at least six months, according to the state. The state also closed its last sheltered workshop, at the John E. Fogarty Center of North Providence, in the second quarter of the year, according to the state’s report. All participants moved either to competitive employment or day programs, a DDD spokeswoman said. While the supported employment program is only about jobs, young adults seeking a service provider for the first time tend to want something else that is more comprehensive, particularly since they work only an average of about 14 hours a week, according to the state’s figures. They and their families generally want one provider to give them an array of work and non-work supports that take into account all their needs and preferences. Some choose to bypass a service agency altogether and manage their own program of services, hiring staff and arranging schedules while a fiscal intermediary pays the bills from a funding authorization approved by the state. Self-directed individuals have reported difficulties getting services from the supported employment program. Of about 500 so-called “self-directed” individuals and families, it’s not clear how many run their own programs by choice and how many first sought and could not find an agency to provide services appropriate to their needs. The number of self-directed programs has grown in the last few years, by all accounts. In all, about 3,700 adults receive services funded by DDD. The impetus for the supported employment program came from an order issued in May, 2016, by U.S. District Court Judge John J. McConnell, Jr., who presides over the case. But the supported employment program now in place does not address basic funding mechanisms for adults with developmental disabilities, which, according to the U.S. Department of Justice, incentivize a segregated system of day services. The DOJ criticized both the funding and regulatory structures in the 2014 findings that laid the groundwork for the consent decree. During the past year, BHDDH has engaged providers, families and advocates in an effort to rewrite DDD regulations, with an eye toward giving consumers of services and their providers greater flexibility to individualize programs and help meet the “integration mandate” of the Americans With Disabilities Act, which the consent decree is meant to enforce. The proposed changes were submitted late in 2017 to the Office of Regulatory Reform – part of the Office of Management and Budget – but the draft regulations have not yet been posted for public comment on the website of the Secretary of State. Kevin Savage, the licensing administrator at BHDDH, said August 21 he expects the Office of Regulatory Reform to complete its work and release the regulations any day. The federal court monitor in the case, Charles Moseley, has often expressed concern about teenagers and young adults with developmental disabilities because, without appropriate supports, they are at risk for a life of isolation once they leave high school. The 2014 consent decree originally required the state to find jobs for all members of the young adult, or “youth exit” category, by July 1, 2016. When the deadline arrived, however, only 29 individuals had jobs in a group that, at that time, numbered 151. After the monitor, Charles Moseley, ordered the state to make sure it counted all young adults who met eligibility requirements for adult services under state law, the size of the “youth exit” population ballooned. It is now 426. McConnell, the presiding judge, extended the employment deadline for all young adults to 2018. He required half of them to have jobs by June 30 – a goal that has been met – and the remaining 50 percent to find work by Sept. 30. Going forward, the state said in its report, DDD is planning amendments to contracts with providers to use unspent supported employment money from the first half of the year, as well as other strategies to improve service to the young adult group. One promising initiative, say state officials, is a cooperative agreement involving the Department of Labor and Training (DLT) and as many as 11 providers of developmental disability services, the Sherlock Center on Developmental Disabilities at Rhode Island College, and the Rhode Island Developmental Disabilities Council to forge relationships with business and generate at least 77 new jobs. The Business Innovation Factory will provide enhanced technical assistance for the overall project, financed through workforce development funds administrated by DLT. DDD also raised the possibility that some young adults may ultimately choose not to work, a decision that must be documented in a “variance” to the state’s Employment First policy for adults with developmental disabilities. Employment – and the variance process – will be discussed at a public forum Sept. 11 at the East Providence Senior Activity Center, 610 Waterman Ave., East Providence, on Sept. 11. Most people don’t give a second thought to what it takes to meet a friend for coffee or a shopping foray. They just call or text and go. But for Wendy LeBeau, a Rhode Islander living with the challenges of developmental disabilities, arranging a casual get-together is a big deal. She’d have to get someone to drive, not so easy when her schedule of state-funded supports allows limited time for one-on-one service. On Aug. 7, LeBeau joined some 50 people at an event space next to The BRASS in Warren– an art gallery where she works – for the first of several “Community Conversations” sponsored by the Community Provider Network of Rhode Island, a trade association of private service providers that support adults with developmental and intellectual challenges. When LeBeau was asked about her ability to connect with friends, she replied “only at work.” She is a contributing artist at The BRASS, where she has created abstract canvases of dancing, swishing color. The work of LeBeau, which features a carefully chosen palette and controlled style that belies the flowing compositions, has been shown at the National Portrait Gallery at the Smithsonian Institute and an annual Art Ability exhibit at Bryn Mawr Rehab Hospital in Philadelphia. LeBeau’s comments, as well as those of others, put a face on what it means to depend on others to arrange even a simple outing. The remarks responded to questions posed by Donna Martin, executive director of CPNRI, who made her way around the audience, asking individuals seated in a huge circle of chairs to share their experiences, including any barriers they faced to feeling included in their communities. In various ways, LeBeau and others pointed to a common underlying theme – a shortage of qualified staff available to individualize services so that adults with developmental disabilities may access their communities for work and leisure, as envisioned by the Americans With Disabilities Act. Since a $26 million funding cut by the General Assembly forced private service providers to slash wages in 2011, the field has been plagued by high turnover and difficulty among employers in recruiting and retaining new staff. At the same time, a federal consent decree in effect since 2014 requires more training and professionalism in the way adults with developmental disabilities receive support services. Since 2011, there have been a few incremental wage increases, but the field of direct care has not recovered. Martin puts the current average pay for direct service workers at about $11.45 an hour. That’s $1.30 above the minimum wage of $10.10. Rhode Island’s minimum wage is set to increase to $10.50 January 1, 2019, but the pay for those who work with adults with developmental disabilities will remain the same. Darlene Faust, Director of Self-Advocacy and Work Preparedness at Looking Upwards, cited the labor shortage and a lack of adequate transportation as barriers to inclusion. She said her agency recently lost a staff member to Walmart. After the meeting, Faust elaborated on the staffing situation. When workers call in sick, she said, she and others in management often must fill in to provide direct support, because the back-up pool is so small. And when the agency is short-staffed, trips into the community must be prioritized. Clients must get to their doctors’ appointments and to their jobs no matter what, she said. “People outside the community don’t always understand,” she said. A number of people who spoke in American Sign Language said that a lack of interpreters posed barriers in various areas of daily living, including their ability to find jobs. Meanwhile, a Woonsocket man who called himself Tim said he is 28 and has been looking for work since he was in high school. Although several prominent corporate employers have taken the lead in hiring adults with developmental disabilities in Rhode Island, Tim said he believes there is still “a lot of prejudice out there” against taking on workers who face intellectual or developmental challenges. He said it would be helpful if agencies providing employment supports could offer “task-oriented vocational training” to job seekers before they actually apply for a particular position. The “community conversation” is the first of five such meetings planned by CPNRI in the coming months to cultivate and encourage sustained grass-roots advocacy on issues affecting anyone with a stake in services for adults with developmental disabilities, Martin said after the meeting. The schedule for the remaining conversations, in different areas of the state, is still being finalized, she said. CPNRI also plans candidate forums for legislative and gubernatorial candidates after the September primary elections, Martin said. In a show of hands, about two thirds of the audience indicated they were registered to vote, including most of those who receive services funded by the state. On Tuesday, Aug. 7 in Warren, RI, The Community Provider Network of Rhode Island (CPNRI), will hold the first of several “community conversations” to focus on priorities for adults with developmental disabilities. The event, from noon to 1:30 p.m. Tuesday, will be at The BRASS, an art gallery at 16 Cutler St., Warren. CPNRI describes the “community conversations” as forums to engage adults with intellectual and developmental disabilities, their families, friends, direct support staff, and any others interested in becoming more effective advocates. The BRASS, the site of the first meeting, is a gallery featuring work of artists with developmental disabilities who are supported by L.I.F.E. (Living in Fulfilling Environments). L.I.F.E. and Looking Upwards, another East Bay provider of services for adults with developmental disabilities, are co-sponsors of Tuesday’s event. The remaining schedule for the community meetings has not yet been firmed up, according to Michael Beauregard, a spokesman for CPNRI, a trade organization for about two dozen, or two thirds, of private providers of services for adults with developmental disabilities in Rhode Island. In May, CPNRI sponsored a rally that drew about 1000 people to the State House to call for restoration of an $18.4 million cut to developmental disability services that was then under consideration by the House and Senate. Almost all the money has been put back into the budget which went into effect July 1. But wages for front-line workers remain flat – at an average of roughly $11.50 an hour –at a time when federal officials are pressing for more raining and higher quality services as part of a 10-year mandated overhaul of the developmental disability system to comply with the Americans With Disabilities Act. Anyone interested in attending Tuesday’s meeting is asked to RSVP here. CPNRI also may be reached at 401-773-7771.